Following the success of its Herald range of family cars, Triumph introduced a new model based on the same platform - the Triumph Vitesse. The Vitesse featured the distinctive twin up swept headlamps to mark it out from its more modest stablemate, was originally fitted with a 1600cc engine and available as a saloon or convertible. 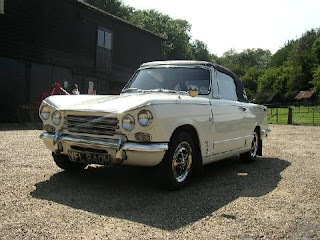 In 1966 Triumph replaced the 1600 with the more powerful 2000cc six cylinder engine from the Triumph 2000 coupled to twin Stromberg carburettors giving the car impressive performance for the day enabling it to reach 60mph from standstill in around 12 and a half seconds and go on to 95mph. In 1968 the engine was upgraded further pushing the 0-60 down to 11.9 seconds and the top speed over the magical 100 mph mark. Further improvements were made to the car to improve the handling on the Vitesse 2 litre Mk 2. Production finally ended in 1971. A proper four seater, performance tourer, the Vitesse was a distinctive feature on British roads for many years.